The Religious Society of Friends has always believed that anyone can discover the deep spiritual certainty that we each have the Light or ‘that of God’ within. Experiencing this, even seasoned soldiers might suddenly find it impossible to kill another person. Of course there are other reasons one might object to military service – such as a profound conviction that a particular war, like the Iraq war launched in 2003, is illegal and immoral. Such convictions can develop after volunteering to serve in the military. Military service is currently voluntary in Canada, so policy focuses on eligibility for release when a member of the Canadian Armed Forces (CAF) claims CO status. Canada defines conscientious objection as “a sincerely held objection, on the grounds of freedom of conscience or religion, to participate in: a) war or other armed conflict; or b) carrying and use of weapons as a requirement of service in the CAF.”2 When someone applies for CO status, the CAF says it considers a number of factors, such as the nature of the conscientious objection, its credibility (for instance by comparing asserted beliefs to records of conduct), and the applicant’s religious affiliation. The factors considered may not accurately represent or measure a person’s objection to military service, especially if their conscience or religious faith has changed such that past behaviours don’t reflect current beliefs. Just as significant is who makes the decision. The UN Commission on Human Rights, as well as other international legal bodies, call on governments to have “independent and impartial decision-making bodies” to consider CO claims.3 This makes good sense. It’s commonly accepted in democracies that a judge should be independent and free of obvious conflicts of interest. However Canada’s policy fails to meet this standard. The approval or denial of CO claims is done by officers within the CAF. Given the heavily hierarchical nature of the military, it can be very difficult to make a CO claim, knowing you will disappoint, and have your case judged by, your superiors, to whom you will have to speak against the very beliefs they hold dear and have been trying to instill in you. We couldn’t find a single story of a Canadian CO since the end of conscription. It’s not clear whether this means there are none or they keep low profiles. Canada is also among a number of countries that still recruit minors. International law asserts that states can recruit minors of 16 and 17 years of age (but not deploy them) if the recruit and her/his guardian are informed of the risks and obligations of military service. Yet one of the biggest risks is rarely, if ever, spoken of. The US has a vastly larger military than Canada’s, and uses aggressive and misleading recruitment tactics. After shadowing a recruiter as part of a special program, US Air Force Staff Sergeant Jacob Williams had many serious concerns. He noted that, “Recruiters obtain contact information through sketchy means, they use that contact information to harass families, insult parents and ignore their legitimate requests to be left alone, and then they try to make minors feel like terrible people for accepting their parents’ financial aid as they go through higher education.”5 Recruits are often misled and told they won’t be deployed overseas. It’s little surprise, then, that stories of US conscientious objectors are more common. A US government report shows that in a four year period there were 425 applications for CO status, and of those only 224 were approved. Though only 425 applications were reported, the number of conscientious objectors is likely far higher. Unlike Benderman, many soldiers may try to just disappear, perhaps because they haven’t heard of or don’t know how to apply for CO status, or because when they mention it they’re shamed and verbally abused, making them believe their applications won’t be fairly heard and will just be denied. In desperation, some decide to flee to other countries. Since 2003 CFSC has joined with the War Resisters Support Campaign in helping former US soldiers who’ve come to Canada seeking refuge. We feel that Canada should welcome and protect those who express their conscience. Instead, we’ve been told by both Conservative and Liberal Ministers of Immigration that US war resisters are inadmissible to Canada due to ‘serious criminality.’ Canada alleges this because the crime of desertion from the military carries a maximum penalty in the US of life imprisonment! In 2017 we began supporting two CO/refuser groups in Israel/Palestine – Mesarvot, a Jewish network, and Urfod, a Palestinian-Druze network. What these networks are up against is significant! Young Jewish and Druze citizens of Israel are conscripted to serve in the Israeli Defense Forces (IDF). It’s common for anyone who doesn’t serve to be seen as a coward or traitor, harming their social standing. Failure to serve also closes off: access to certain scholarships, discounts on loans and house mortgages, easier admission conditions for academic institutions, and even some future career prospects. There is tremendous pressure to ignore one’s conscience and join the IDF. In Israel there are different types of exemption one can apply for. COs may choose to go the easier route of applying for medical or mental health exemptions. Those who are determined enough to seek CO status, with its much longer and more daunting process, appear before a committee that has no clear and published procedures (it did for women until 2004, but that has since changed). Both Mesarvot and Urfod educate about the realities of service in the IDF, helping young people understand the various options available to them. Free legal consultations are provided when necessary, and those who decide to go public with a conscientious objection are trained on how to talk to the media. A community of support is crucial in helping teens make informed choices that will affect the rest of their lives. These networks bravely share vital information in a context where it is a crime to encourage anyone not to serve in the IDF. Quakers remain active in advancing the human right to CO internationally, and CFSC supports this work through our annual financial contributions to the Quaker United Nations Office. They’ve helped take CO from a fringe issue the United Nations wasn’t too concerned with to one on which legal precedents and official guidelines exist. You can find out more about this at https://quakerservice.ca/CO. Keira Mann is CFSC’s Program Assistant and Matthew Legge is CFSC’s Peace Program Coordinator. 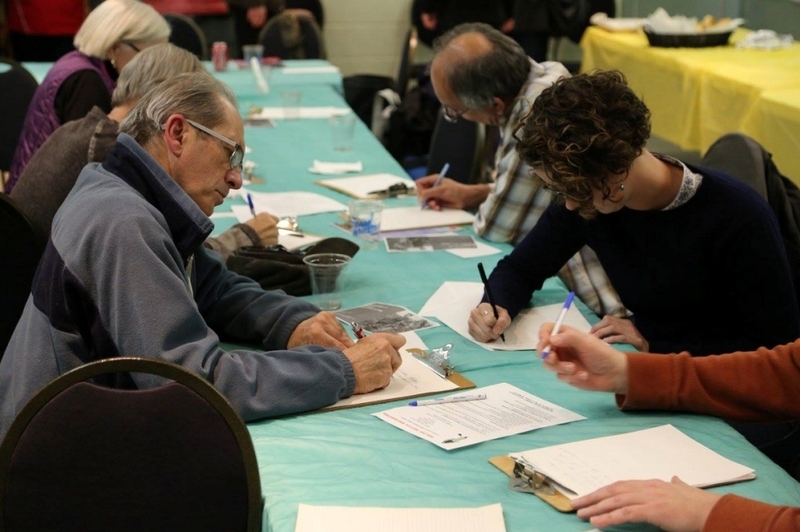 The photo that appears with this article is of Canadians writing in support of US war resisters. It was taken by Alex Lisman.